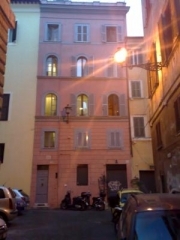 The accommodation is ideal for those who wish to enjoy a particularly strategic location that enables most visits to be made on foot, including the Basílica de San Pietro, Castello Sant Angelo, Largo Argentina, Plaza Venezia, la Fontana di Trevi, Plaza del Popolo, Plaza di Spagna and the famous Coliseum. The area also offers a large variety of bars and restaurants, typical “trattorias” ( with traditional Roman cuisine). The flat was very carefully reformed in great detail to create a welcoming and relaxing atmosphere, and is the perfect choice for any kind of trip – as a couple, with friends or for business visitors who can also make the most of their stay to see the city. The loft includes a comfortable French-style double bed, and a wardrobe for storing belongings. 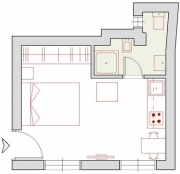 There is also a small kitchen with four cooking rings, and fitted with everything guests might need for preparing their favourite dishes: microwave, American coffee maker, and toaster. Alongside the kitchen is a table seating four people. The bathroom includes a shower, ideal for a welcome break. 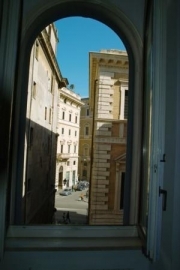 Easy to reach from Termini Station by bus 64 stop at Piazza Navona.